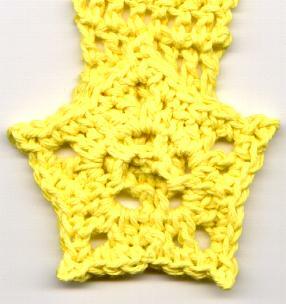 This fastener matches the Star Coaster and Ornament on my pattern List Page. Work as done in main towel topper pattern. Then continue on in rounds. Ch 3 picot: Ch 3 and sl st back in 1st ch. Rnd 1: Ch 1, turn, sc in nest st, sc next 2 sts together, sc in next st, sc next 2 sts tog, sc in next st, join in top of 1st sc with a sl st.
Rnd 2: Ch 1, sc in same st as joining, ch 3, (sc in next sc, ch 3) 4 times, join as in rnd 1. Rnd 3: Ch 1, (sc in sc, in ch 3 loop do hdc, dc, ch 3, dc, hdc), repeat around and join as before. Rnd 4: Sl st into next hdc, ch 1, (sc in hdc, sc in dc, in ch 3 space do sc, ch 3 picot, sc, then sc in dc, sc in hdc, skip next sc) repeat around. Join as before.